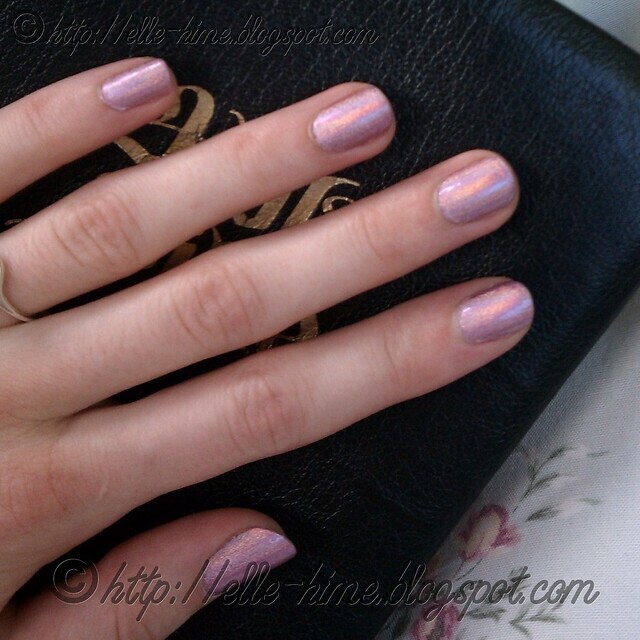 Princessly Polished: NotD: Nfu-Oh #63 Victorian Polish - Hologram! So I figured I'd get around to playing with the new LCN polishes first... but then something amazing happened yesterday - the sun came out! I hurried to get my new holographic pink polish on my tips and toes~ While I was out today I had to snap a few more pictures, and my HTC Incredible did a great job at capturing this prismatic beauty. Even better than the family camera I usually grab! I'll do more of a review in the future, but I could not resist sharing these shots for now! I used a top coat on my left hand. As you can see it does not diminish the holo effect at all! In the shade there is still a soft rainbow effect, but it barely shows on camera. Still a simply gorgeous color, though. I love it! I don't have any indoor light photos, but the holographic effect shows up great then, too. And a shot of my right hand (no top coat). Whoa, tip wear! No toe pictures, but they're just as fantastic, and chip-free! These photos are so great :) perfectly in focus and great angles. I'm motivated to strive for better photos on my blog now! And aren't the Nfu Oh bottles so cute?! Well, these are 4 photos out of probably 20 I took... haha. I just keep snapping away. Fortunately we had major sunshine on this day and my phone does well in strong sunlight! It got better pictures of this holo than the little camera I usually use.